I watch the original Star Wars trilogy at least once a year and every time I see it, it reminds me of why this trilogy still works so many years later. I think it's the sense of fun and adventure that carries throughout each movie. A big part of that fun is Han and Chewbacca's relationship. They bicker, they poke fun at one another, but you can tell they care and that there's a deep friendship there; even though you can only understand one of them. One thing I didn't like, and till this day bugs me, is that at the end of a New Hope, Chewy doesn't get a medal for his bravery. Even as a kid I was outraged. You think Han just changed his mind all of a sudden and went to help the Rebels? No way! 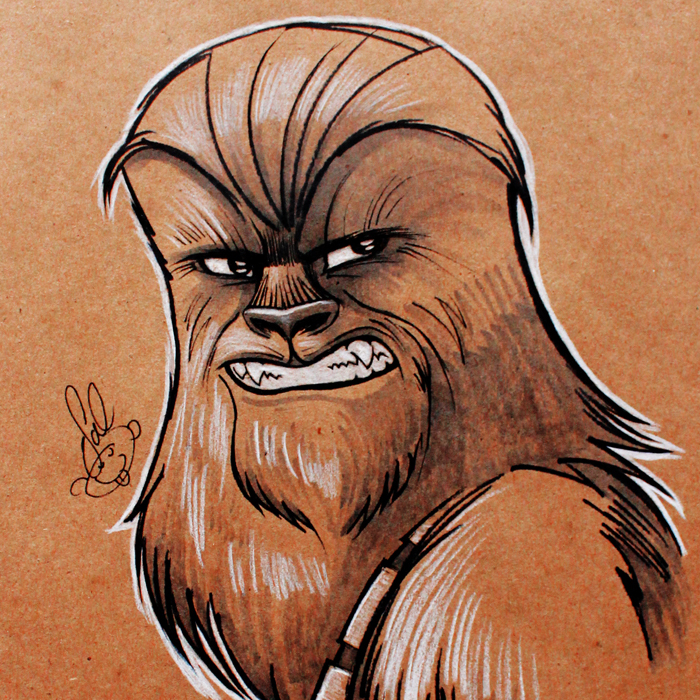 Chewy had to have said something to him. They must have argued and Chewy must have made his point and that's when they turned the Millennium Falcon around. So I decided to do a tribute to the lovable fuzz ball. Yes, the Wookie SHOULD win. You can pick up this one of a kind piece up in my store. And may the Force be with you!